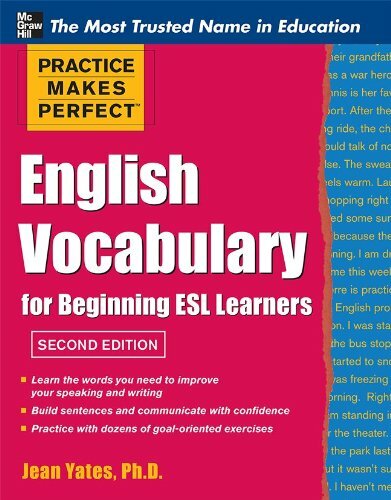 [PDF] Practice Makes Perfect English Vocabulary for Beginning ESL Learners (Practice Makes Perfect Series) | Free eBooks Download - EBOOKEE! Description: Master the words and phrases necessary for handling everyday situations Practice Makes Perfect: English Vocabulary for Beginning ESL Learners helps you develop your vocabulary by providing practice in word-building and encouraging you to analyze new words for an ever-increasing vocabulary. Each chapter of this comprehensive book focuses on a theme, such as family or travel, so you can build your language skills in a systematic manner. As you lay the foundation for an increasing vocabulary, you are able to perfect your new words with plenty of exercises and gain the confidence to communicate well in English. Practice Makes Perfect: English Vocabulary offers you: More than 220 exercises Concise grammatical explanations A new chapter on contemporary vocabulary An answer key to gauge your comprehension With help from this book, you can easily speak or write in English about: Different occupations and jobs * American holidays and traditions * Taking the train * Growing your own garden * Where it hurts on your body * Your house * Your family and friends * What you studied in school * Your favorite TV show * Your family's background . . . and much more! No comments for "[PDF] Practice Makes Perfect English Vocabulary for Beginning ESL Learners (Practice Makes Perfect Series)".